Apple released the second beta for iOS 11.4.1 on Monday, June 11. The company seeded the update 12 days after the release of the first 11.4.1 beta on May 30. The initial beta brought no new features to iOS 11, just bug fixes and stability updates, and beta 2 appears to be the same case. While the beta 2 install screen lists "bug fixes and improvements" just like beta 1 did, there's no telling what those are. Apple's release notes for the update is also void of any known or fixed issues, so what these 11.4.1 betas actually include is anyone's guess. We will keep on looking into this latest beta to see if there is anything worth noting, and we'll update you if we find anything. 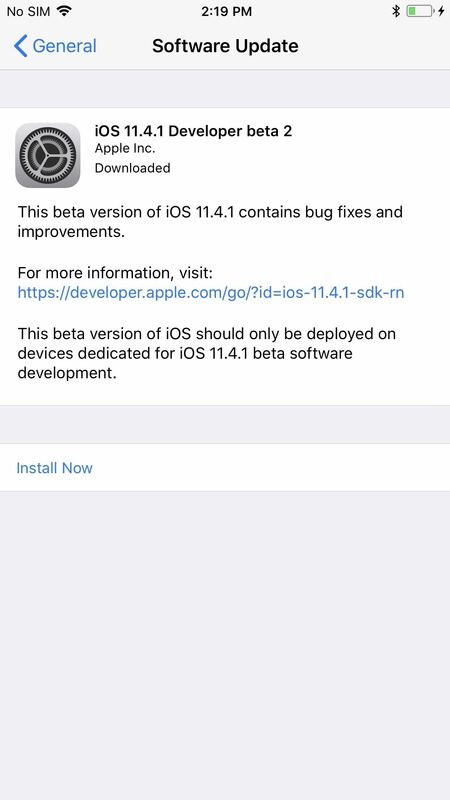 You can download the iOS 11.4.1 beta 2 right now if you're a developer or public beta tester with a valid configuration profile. Like always, open the Settings app, tap on "General," then select "Software Update." After that, simply follow the on-screen instructions to download and install iOS 11.4.1 beta 2 onto your iPhone. While it's true all of the known problems with beta 1 are most likely carried over in this update, there are plenty of reasons to make the leap to beta 2. Chief among those reasons is security — if Apple found any security flaws with beta 1, that software is now less secure than beta 2. We'd recommend you update as soon as possible if you are indeed running the beta. So far, iOS 11.4.1 is far from the most interesting iOS beta out right now.iOS 12 is currently in beta testing, as it ramps up iPhone performance to a new level. Users who adopted the platform noted Apple for its improvements from the official built of iOS 11, barring the bugs and glitches that are to be expected with any beta software. It's not just the performance boost, either. The new iOS 12 software features notification grouping, new and improved Animojis, Memojis, and even a secret lock screen weather widget. That's just the tip of the iceberg — for more information on what's new in iOS 12, check out our list below.